What’s with all those letters in the headline? Well, Thanksgiving is only one month away. 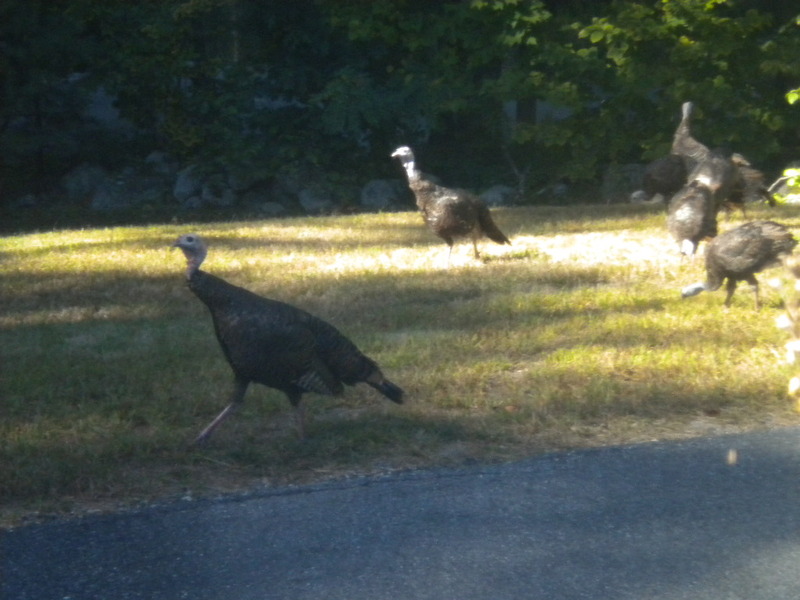 I looked out on my front lawn this morning and I do believe these turkeys have gotten the word…they are on the run. 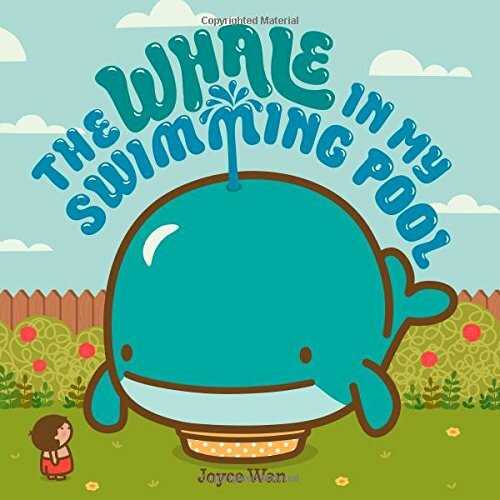 Finding turkeys in the front yard is one thing…finding a whale in your swimming pool is way more unusual…author/illustrator Joyce Wan was definitely thinking outside the box when she came up with her latest book. So the first bunch of letters in the headline are for Perfect Picture Book Friday. You’ll have to read to the end of this post to discover what the other letters are for. 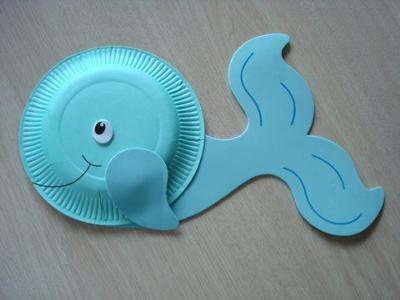 If you want a blue or gray whale, you can paint or color In the paper plate. For a simpler project, leave the plate uncolored and make a white whale. Cut construction paper tail and fin. Glue on tail and fin. Add features with marker or crayon. As I mentioned in the beginning of this post, Thanksgiving is just a month away…which means that the month of November is just around the corner. And if you love picture books, you will love PiBoIdMo! I want to share a bit about Picture Book Idea Month or PiBoIdMo. I discovered the amazing Tara Lazar and her fabulous picture book idea challenge back in 2011…I was just starting to dip my toes into the world of writing for children. I lurked in the shadows that November, reading the guest posts and leaving a couple of comments. When 2012 rolled around, I wasted no time. 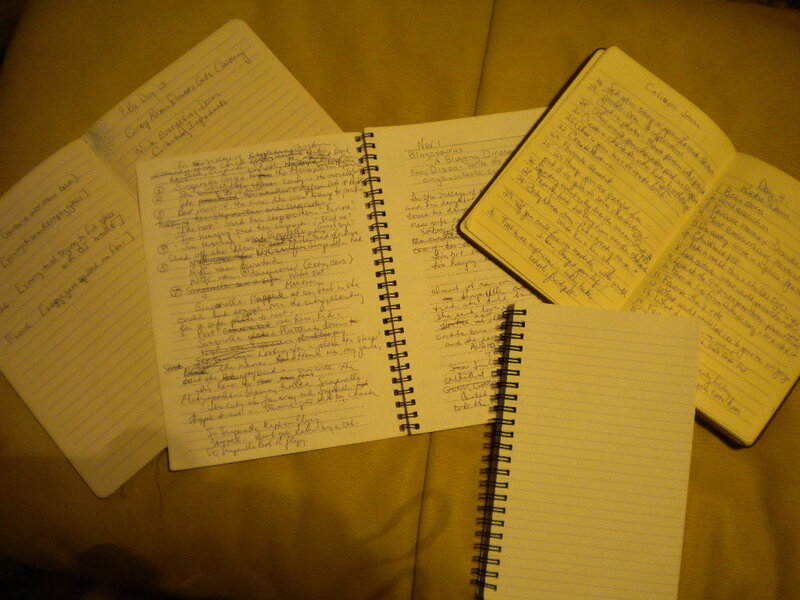 I signed up, got a new notebook, and actively participated by reading and commenting and jotting down my story ideas. And every year since then, I’ve looked forward to November because I know that PiBoIdMo is coming. To be honest, this challenge played a big role in sparking my enthusiasm for writing picture books. So don’t hesitate! It’s free! It’s fun! It’s fabulous! Whether you are a newbie, just thinking about writing for children, or a multi-published author or illustrator, this is the one challenge you don’t want to miss. Sign up on her blog. Oh…and did I mention the prizes? Oh yeah! Books and critiques and all kinds of good stuff! This entry was posted in Crafts for kids, Perfect Picture Book Friday, Picture Book Idea Month (PiBoIdMo), Picture Book Review and tagged Joyce Chen, Picture Book Idea Month, The Whale in My Swimming Pool, Whale Paper Plate Craft by viviankirkfield. Bookmark the permalink. Love the voice of this blog post–finding a whale rather than a turkey. ha! Yep, looking forward to Piboidmo! Hey, Tina…now there is a good thought for a pb…The Thanksgiving Whale. 😉 See you at PiBoIdMo! I have seen this book and it really looks like a lot of fun! I always enjoy your wonderful activities. I love how you suggest a simple craft with your PPBF. Can’t Wait for PiBoIdMo either! Sounds like a great book! Finally the child is forced to cajole and bribe and try all sorts of tactics to get cooperation…..a fun flip! And I love the blue whale activity! Great way of looking at it, Beth…turning the tables on how parents are usually the ones who plead to get the kid to cooperate. 😉 And I’m a sucker for paper plate activities…so easy, so inexpensive, so fun! Joyce has created an adorable book. Psyched for PiBoIdMo too! I will definitely look for “The Whale in My Swimming Pool.” And I wholeheartedly agree that PiBoIdMo is not to be missed. Last year’s challenge filled my pool (with ideas)! Oh my goodness, Gabi…I just this minute went to your blog and left a comment…I had seen your comment on the PiBoIdMo Facebook page and wanted to see your new blog! Thanks so much for coming over to mine. This is my 5th year doing the challenge…it’s fabulous! I reviewed this one a few week’s back, like you the sparse language and big bold illustrations drew me in. I think more than one review of great books like this is just fine, Vivian! Saw this book at the store, so adorable. See you at PiBoIdMo! You are right, Darshana…it’s adorable…Joyce Wan has a great style! It is lots of fun…can’t wait to read it to my grandson! Thanks for stopping by, Andrea. I can’t wait for Pictur eBook Month either, Vivian! See you there! Thank you so much, Clar…glad you enjoyed the activities…aren’t paper plate crafts the bomb? I’ll be waving at you in the comment section of PiBoIdMo! I like this book a lot – and you have some fun activities. After years of PiBo I’m gonna take this November off and do NaNoWriMo…. have fun with Tara and crew. Reminds me a little of Billy Twitter and His Blue Whale Problem by Mac Barnett. Lots of tongue in cheekiness, eh? I’ve signed up for PiBoIdMo. Wheels are turning! The title reminds me of a picture book my kids loved–The Dinosaur in my Backyard. This sounds equally fun. Best of luck with PiBoIdMo month Vivian! I didn’t know about Picture Book Month learn a new thing everyday thanks for illuminating me!